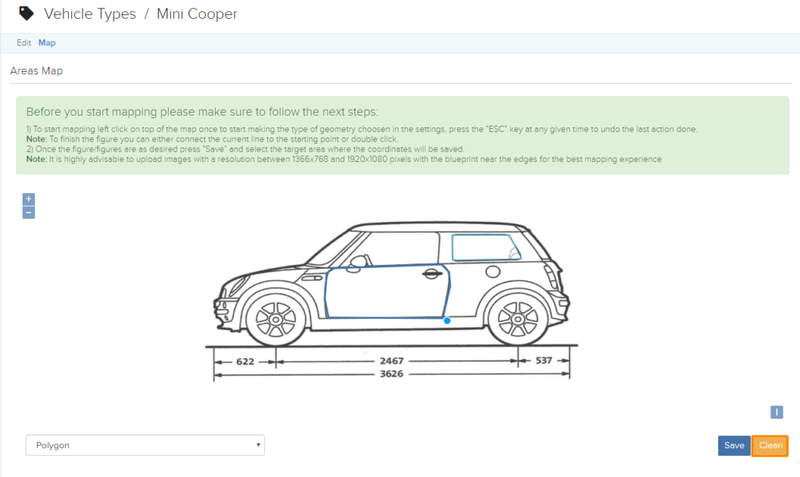 This Vehicle Types page gives you an overview of all the vehicle types you have in the system. How to add a new vehicle type? Firstly, click on the blue “Add Vehicle Type” button located on the top right of the page, highlighted in orange in the picture below. Once you have clicked the button, a new page will appear. Here, enter the details of the vehicle type and click on the blue “Save” button, highlighted in orange in the picture below, to save the vehicle type. How to delete a vehicle type? Firstly, click on the vehicle type that you would like to delete. Once you have done so, a new page will appear. Here, click on the red “Delete” button located on the top right of the page, highlighted in orange in the picture below. You can create new vehicle damages section on your car vehicle map. To do so, click on the Map tab located at the top of the page, highlighted in orange in the picture below. Next, follow the steps to create your own section. Click on the blue “Save” button highlighted in orange in the picture below, to save the sections once you have finished. What is Vehicle Type Areas all about? 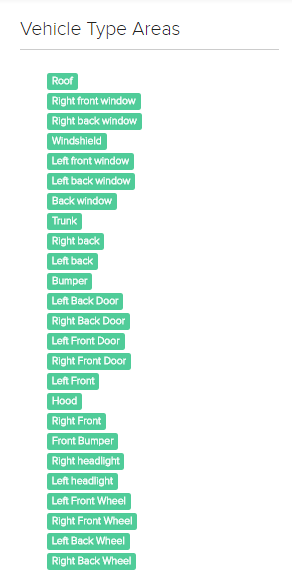 This Vehicle Type Areas box gives you an overview of all the vehicle type areas that you have created with the vehicle mapping system. How to add a new vehicle type area? You can create a new vehicle type area by following the steps above under the vehicle mapping section of this article. How to delete a vehicle type area? 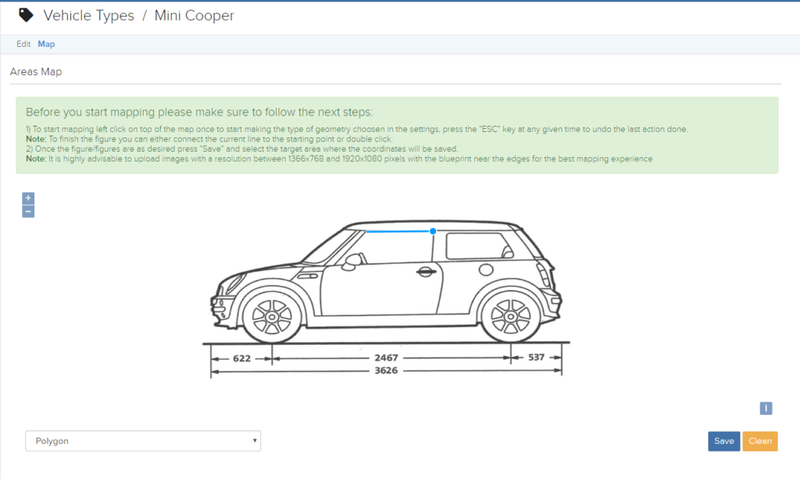 Firstly, click on the vehicle type area that you would like to delete. When you have click on the vehicle type area, a new window will appear. Here click the red “Delete” button located on the bottom left side of the window, highlighted in orange in the picture below. How to create a custom damage map vehicle type? You can create your own custom damage map for the different vehicle types. For example, a bike damage map will definitely not be the same as a car damage map. In this example, we will be creating a mini cooper vehicle type with a custom damage map. Create a new vehicle type by clicking the blue “Add Vehicle Type” button on the top right of the page highlighted in orange in the picture below. Once you have done so, a new page will appear. 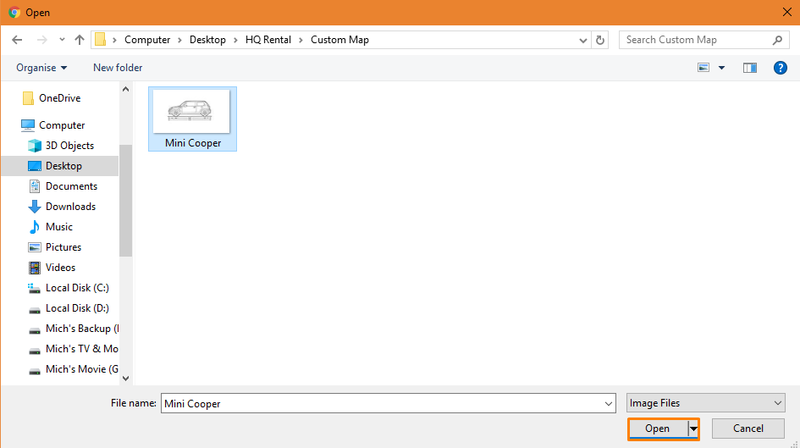 Here, enter the name of the vehicle type that you would like and select your custom map picture by clicking the “Add Image” button highlighted in orange in the picture below. When you click on the button, it will open a new window where you can navigate to where your image is. It is highly advisable to upload images with a resolution between 1366×768 and 1920×1080 pixels with the blueprint near the edges for the best mapping experience. Select your custom damage map and click on the “Open” button highlighted in orange in the picture below. After you have done that, click on the blue “Save” button highlighted in orange in the picture below to save the vehicle type. Click on the new vehicle type that you have just created, highlighted in orange in the picture below. You will notice a new tab called “Map” has appeared. Click on the “Map” tab highlighted in orange in the picture below. Create your different sections by using the 5 different tools that we have. They are Polygon, Free Hand, Square, Box, and Cursor. At any given time, you can press the “Esc” key on your keyboard to undo the last action that you did. To use this tool, simply click on the points on the custom damage map to connect the dots and when you are done, double click to automatically make it a polygon. To use this tool, simply draw on the custom damage map. It will automatically create the section according to what you’ve drawn. We recommend that you use this with a drawing pen. To use this tool, simply click on a point and drag your mouse to create a square. The point you click on will be the middle of the square. To use this tool, simply click on a point and drag your mouse to create a box. The point you click on will be the starting point of the box. This tool helps you to change the shape of your section. For example, if your polygon is out of shape, you can change the shape of it by using this tool. After you have created a section, click on the blue “Save” button highlighted in orange in the picture below. Once you have clicked on the “Save” button, a new window will appear. Here, type in the name of the section and the price for damages. Next, click on the blue “Save” button highlighted in orange in the picture below to save the section. Your new damage will appear on the right of the screen under the vehicle type areas section as shown in the picture below. Repeat steps 5 – steps 7 until you have completed your custom damage map. To change a damage name or price, or to delete a saved damage section, click on the damage you want to edit and a new window will pop up, after you have made changes to the damage, click on the blue “Save” button or if you want to delete the damage section, click the red “Delete” button.